Debonairs Pizza reminds South Africans to take advantage of its free delivery service with a new television commercial (TVC) campaign. Debonairs Pizza is reminding individuals to take advantage of its free delivery service with three TVCs in a campaign called ‘Skaba Dom’. Intended to run over an extended period with different flighting dates for each execution, ‘Skaba Dom’ was shot over two days — one day for the performance scenes and another for the food shots. 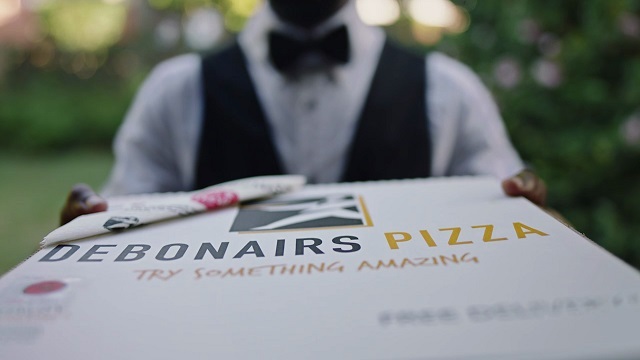 Created by FCB Joburg’s creative director Greg Cameron, art director Kabelo Mabaso and copywriters Matthew Shafto and Kabelo Mabaso, the campaign aims to highlight how – with Debonairs Pizza’s free delivery — South Africans can have their pizza and eat it too. "We don’t need reminding that times are tough. We’re all working hard, but it seems we’re earning less. And we’re all looking for ways to save," says Cameron. "One way is to think smart and cut out those often hidden costs — like delivery. So we think twice before ordering a home delivery, raid the rainy-day reserves to pay for it or even add to our busy schedule by collecting it ourselves," adds Cameron. "‘Skaba Dom’ — ‘Don’t be Silly’ — reminds people that they don’t have to factor delivery into the transaction. ‘Skaba Dom’ means no scratching around for a delivery fee that they don’t have. It means no waiting in collection queues to avoid paying for delivery —delivery is no longer a service you have to pay for because Debonairs Pizza delivers for free," Cameron concludes.